About a 45 minute drive from London, you will find a great day out. I had no idea when we arrived just how big this zoo is. It has an amazing array of animals and you could easily spend a whole weekend wandering around the place. You can even feed some of the animals (I had a go feeding a giraffe and an elephant!). Apart from feeding, there are many talks through the day at different enclosures so you can learn more about the animals. These talks are short, sweet and very interesting. They do have quite a few rare breeds at Colchester Zoo and they are a part of many different breeding programs to try and boost the population of various endangered species. Your legs ache a lot by the time you leave as there is a lot of walking and quite a few hills - buggies and wheelchairs beware! 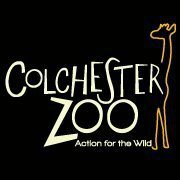 Reasonable entrance fees (£18 adult, £11.50 child) and friendly staff make this a memorable day out for all, especially animal lovers. Why? It has an amazing array of animals and you could easily spend a whole weekend wandering around the place.